Although Dubai offers many options for luxury stay, the Madinat Jumeirah resort stands apart by its size and essence. Your experience starts as soon as you finish check in. You are escorted to your room on a fancy and traditional wooden boat on small waterways that crisscross the property. You can use the boats not just to go to your villa, but also for moving around the vast property, which houses three five star hotels and 29 luxurious villas. Each of the hotels is built on a different concept and style. For example, Jumeirah Al Qasr has an entirely Arabic décor with an equestrian theme dominating the tapisserie, paintings, sculptures and even the curtains as a nod to Dubai’s ruler Sheikh Mohammed’s love for horses. In sharp contrast, Jumeirah Al Naseem, the latest addition to the resort which opened recently, features a more modern and innovative design. 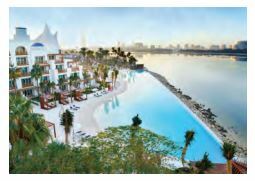 The resort is located on Jumeirah Beach, a heartbeat away from Burj el Arab, the world’s tallest tower. It comes with a private beach that extends to over 2 km and which can host a variety of events. For foodies, Madinat Jumeirah has an amazing culinary range, with over 50 world-class restaurants and of course several activities ranging from the spa to the kids’ clubs. The hotel also boasts a state-of-theart convention centre, multiple ballrooms and exclusives spaces like Magnolia to organise any type of event from conference to weddings or smaller gatherings. Dubai has always managed to host unusual and exciting experiences. Queen Elizabeth II, an iconic cruise liner, is definitely one of them. More than just a hotel with a number of facilities, the ship is an attraction on its own. Once you check in and your baggage is being taken to your cabin, you can amble around the deck and visit the huge boat. You can also visit the museum about the entire story of the ship and its legacy, with numerous books on the subject in the ship’s library. Even if they are just for display, a lot of authentic objects and rooms have been preserved in their original state, as is the casino with its old slot machines or the official uniforms of the crew. 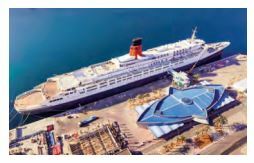 QE II is the Middle East’s first floating hotel and comes with 13 different types of rooms, as well as multiple restaurants and nightlife experiences. Plenty of choice is also available for organising events. The Queen’s Room can serve as a ballroom. Besides private meeting spaces, the original Theatre, the Pavillion Terrace and the Top Deck are also available for hosting events. Dubai’s skyline is crowded with towers of hotels, each bigger than the next. Though their architecture may vary, all the hotels seem to resemble each other and are too big and impersonal. A stay at the Park Hyatt, on the Dubai Creek, offers a completely different feel in the city. The hotel has taken inspiration from Mediterranean and Greek styles, with crisp white walls, deep blue fountains and colourful gardens around. Even the pool here has been designed differently, with palm trees inside. You can also relax in a wonderful lagoon. The hotel features a very nice Cap Cod inspired bar wonderfully placed over the marina on the banks of Dubai Creek. In terms of excitement, this would be our favourite outing in Dubai. We begin by wearing a professional racing suit and helmet and attend a group briefing before the start of the race. Thanks to a reasonably sized track, a good number of people can race together safely and enjoy a thrilling driving experience. Two attractions, Dubai Autodrome and Dubai Kartodrome, offer options for groups to see or get their hands dirty by participating in a team race. At Dubai Kartdrome, different format of kart racing events can be organised upon request, all offering unforgettable experiences. With extremely high degree of customisation, there are also plenty of branding options, including merchandising items. Located in MotorCity, both the Autodrome and Kartodrome have a selection of event spaces and catering services, from the paddock area to the pit garages as well as hospitality suites. We all have seen aerial pictures of Dubai’s Palm Jumeirah of the World’s Island. However, seeing it from air is quite another thing. In addition to stunning views of the city’s landmarks, the 20- minute flight in the seaplane is in itself an incredible experience. The seven-seater plane takes off from the Dubai Golf & Yacht Club at Dubai Creek. A relaxing break like a seaplane trip can be a very good group activity that fits perfectly in an intensive programme. It would also be highly appreciated by photography lovers. Probably the best team building activity in town, a team treasure hunt around Al Fadidi historical district is anything but boring. Armed with a digital tablet with a GPS tracker, you are asked to perform a number of entertaining yet challenging tasks while learning about Dubai’s history. It is really interesting and requires good communication and collaboration between team members. Limited time makes it more lively and the area is set up like an enchanting middle-east market. To solve different clues, spread around a 2 km radius, participants have to navigate iconic spots like the souks or the different museums where they can enjoy the beauty of the local culture. Spread over 5,000 sqm of covered space, the Festival Arena in Dubai was built by a powerful sheikh to please his daughter who wanted an outdoor wedding in the middle of summer. Today, the Arena comes in very handy for organising events that normally won’t fit in hotel ballrooms or convention centres due to their design needs. Managed by Inter Continental Hotels Group, the Festival Arena is a completely open space that can accommodate any kind of event as it is free of the constraints of infrastructure. Located in the gardens of Al Badia Private Golf Course, near the Dubai airport, the complex is suitable for any large scale event. With over 1,500 free parking spaces and a pillar-free main hall, it can accommodate up to 6,500 persons in a theatre configuration. The name of the venue is a giveaway. Everything at the Grand Hyatt is grand indeed. From ballrooms to kitchens and from the lobby to the buffet, everything here is outsized. Located near the airport, Grand Hyatt frequently hosts several of the very large scale events that Dubai has become known for. The Bhaniya Event Space is the biggest ballroom in the Middle East with over -3200 sqm and can accommodate up to 2,500 persons. Most of us have heard of Burj Al Arab, the tallest building in the world. But not many know that Dubai is also home to the world’s biggest picture frame. Located at the Dubai Creek, you can see the old or new Dubai depending upon from which side you look through the frame. A golden arch, reaching 150 m high, it is just the right place to hold very selective receptions to impress your guests. A rapid elevator takes you through the 48 floors to the Skydeck at the top in 75 seconds.